Service Learning is where service, leadership, and ethics meet for the common good. 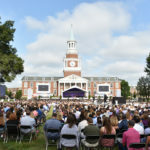 Under the leadership of Dr. Nido Qubein, High Point University students and faculty have served over one million hours in the City of High Point and invested millions of dollars. Following the trail blazed by Dr. Qubein, who has been a life-long citizen and advocate for High Point, the mission of the Service Learning Program at High Point University is to engage students in an experiential and interdisciplinary learning environment that promotes their understanding of and commitment to responsible civic leadership. Students serve in courses where they take the classroom out into the community through real-world service builds on and critiques the theories they read in the class. Students serve in clubs and organizations that make long-term commitments to particular agencies in High Point to become partners for sustainable change. Students serve by becoming engaged in local politics, community development, non-profit boards, and social enterprise opportunities. And recent graduates serve through one of the largest campus-based AmeriCorps VISTA Programs in the nation. The Service Learning Program offers a comprehensive, curricular and co-curricular, approach that engages students in the life of the City of High Point. Together we partner to make High Point a more safe and livable community for all people. 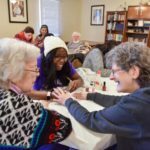 High Point University values service learning as a way to use our liberal arts foundation to promote a more just and sustainable society. The Service Learning Program engages students in connecting the theory of the classroom with the practices of good citizens, encouraging community-based research, active problem-solving, and a growth mindset that fosters creativity and social innovation. Service Learning courses can be found in the Liberal Arts Core Curriculum of the University, in Liberal Arts majors courses, and throughout the University’s professional schools.